Last weekend my family and I visited some friends in their new home, and of course I had to make them an Housewarming Gift Basket! As you know, anytime I get the opportunity to assemble a gift basket I’m in! 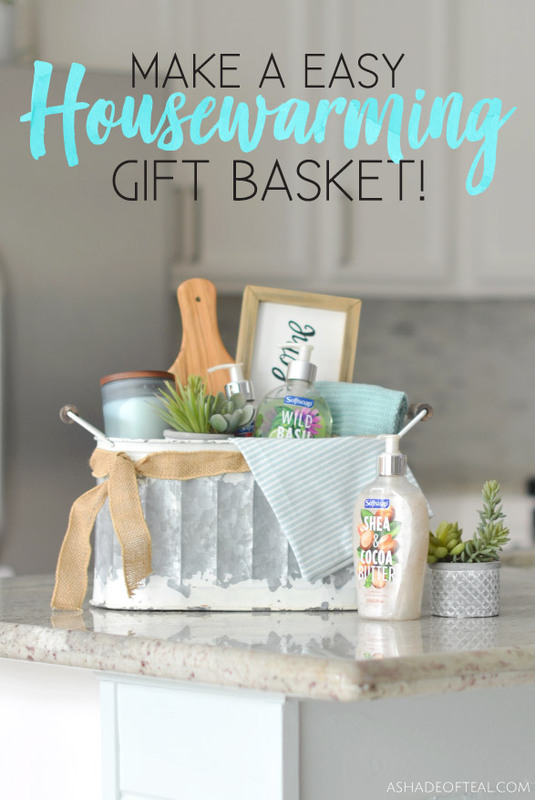 So, here’s how to make a Easy Housewarming Gift Basket! When it comes to making Gift Baskets I always stick to a color theme. I also like to incorporate items that are both pretty and practical. 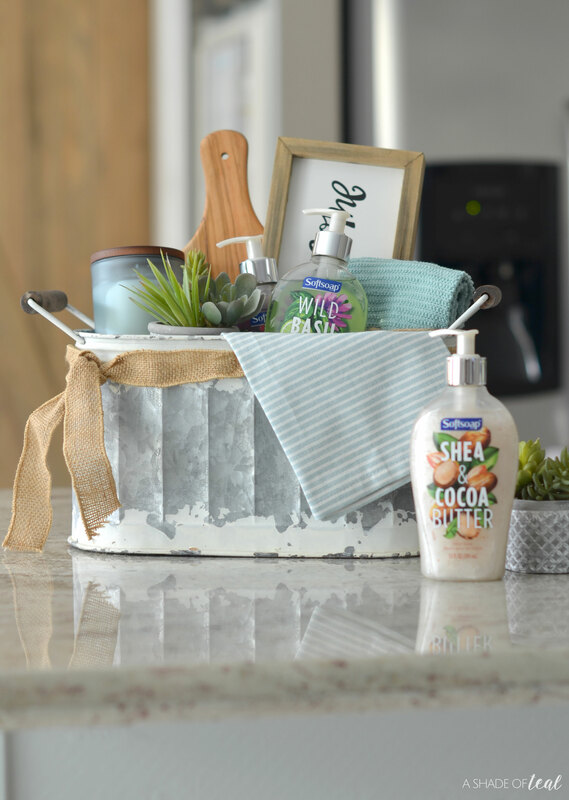 For this housewarming gift basket I went with a kitchen theme and added some simple home decor items. 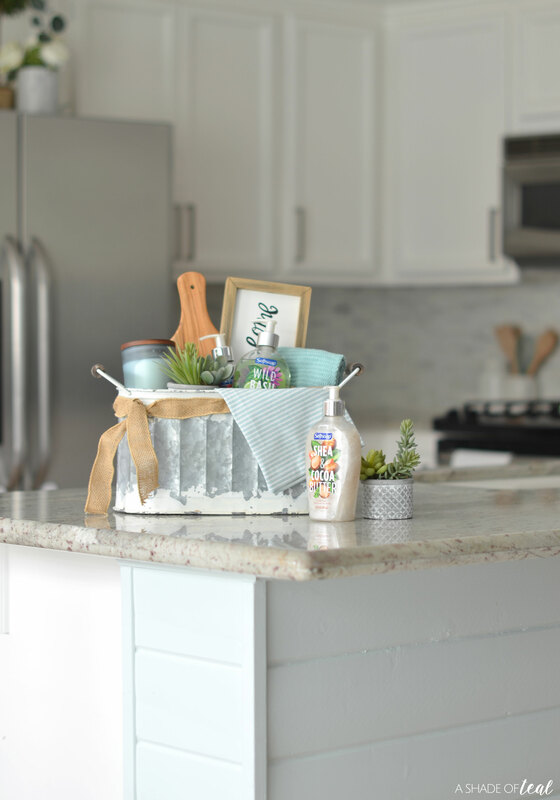 Here are my tips and tricks for making a beautiful Housewarming Gift Basket! To get started you’ll need to go shopping and gather the supplies. 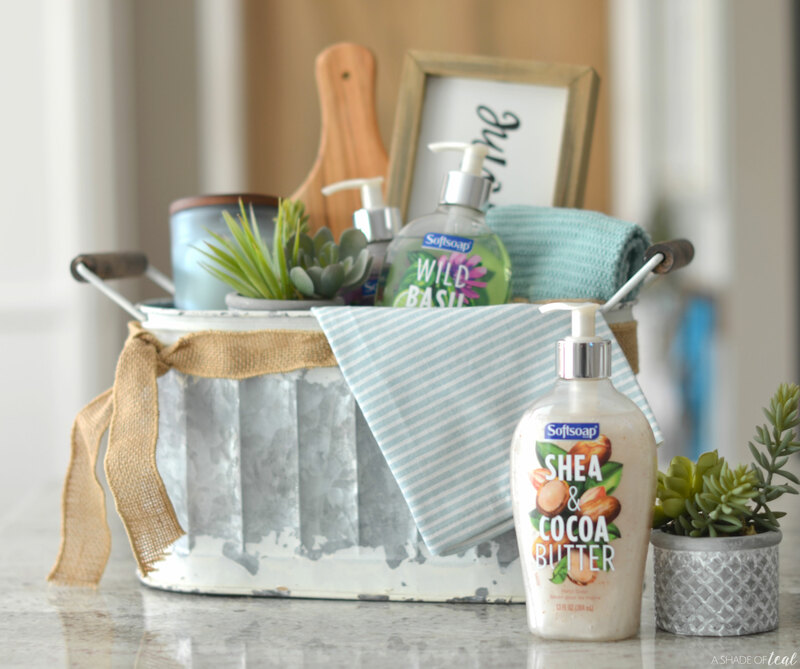 I stopped by Walmart for most of the items since they have my favorite Softsoap® Décor Collection® liquid hand soaps which are absolutely perfect for a gift basket since they’re both practical and beautiful! 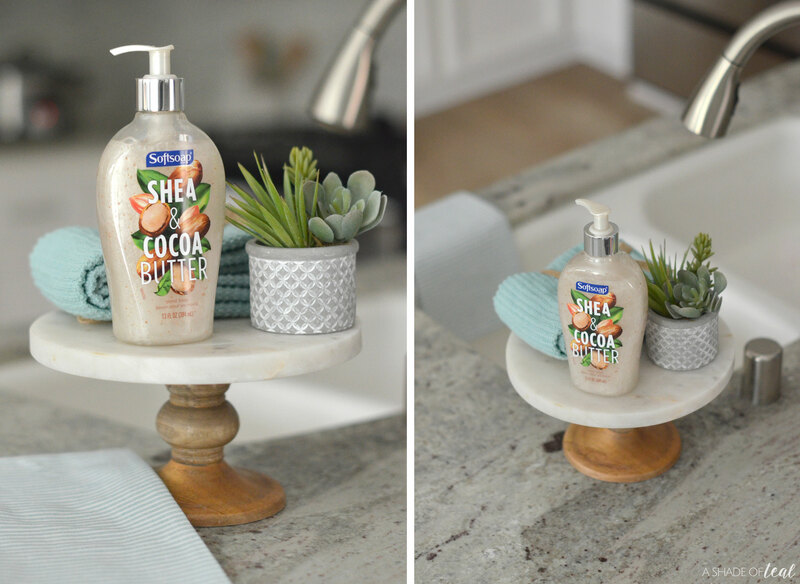 I personally love and use these liquid hand soaps in both my kitchen and bathrooms since the bottles are so pretty. They’re perfect to dress up your space without much effort. Plus, they all smell amazing! Shop for yourself! 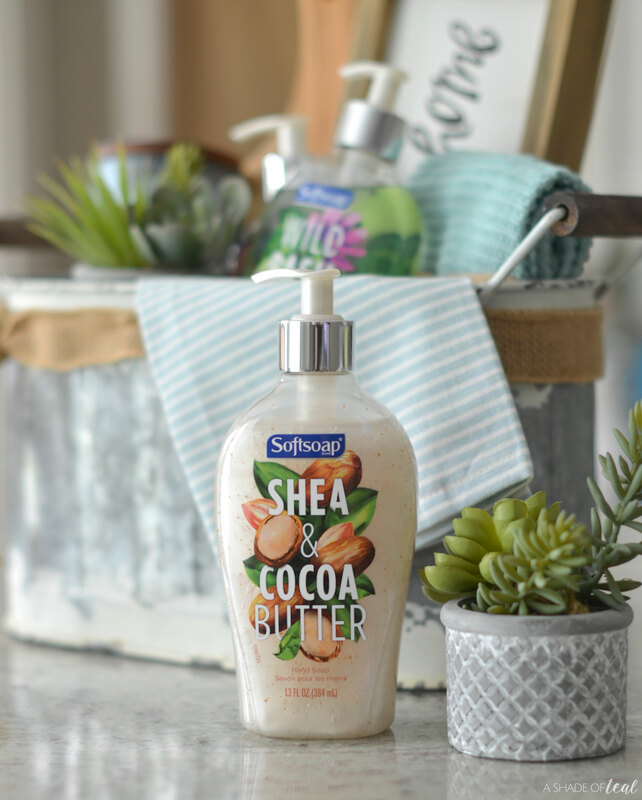 Hover over the photo below & click through to shop these products. Here’s what you’ll need to make this housewarming gift basket. Assembling a gift basket is quick and easy with these tricks. Start with a basket or bucket that can hold everything, you don’t want to over stuff. Use tissue paper or shredded paper for fillers. Drape the dish towel over the basket for dimension. Add the large items in the back and work your way forward with the smaller items. Items like the dish cloths work great for separation between items. Finish with a bow or card and you’re set! My friends loved the gift basket, they especially loved that all the items were practical for their kitchen. They also loved the color theme I choose, but then again who wouldn’t love teal! 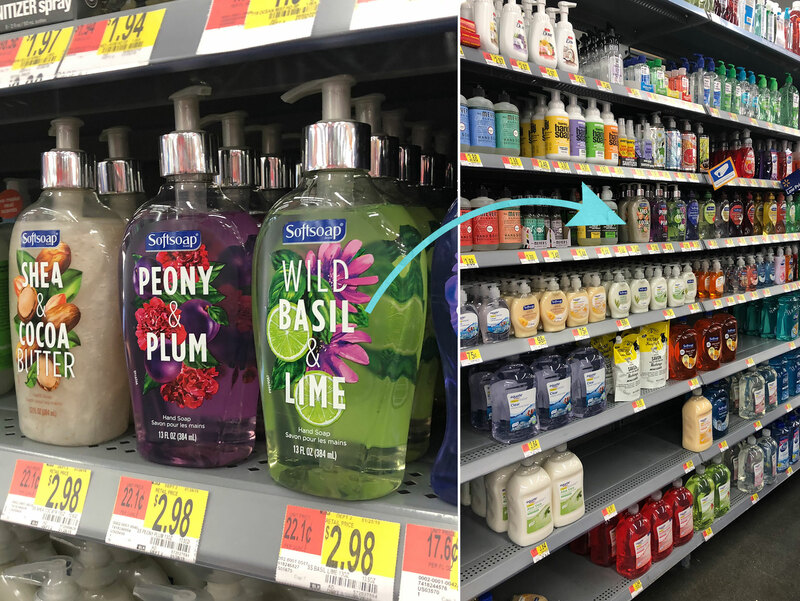 You can find and purchase all 3 of the beautiful Softsoap® Décor Collection® liquid hand soaps (Softsoap® Wild Basil & Lime, Softsoap® Shea & Cocoa Butter, & Softsoap® Peony & Plum) at your local Walmart in their hand soap aisle. Make sure to grab the ibotta offer where you can earn cash back with this ibotta offer HERE. 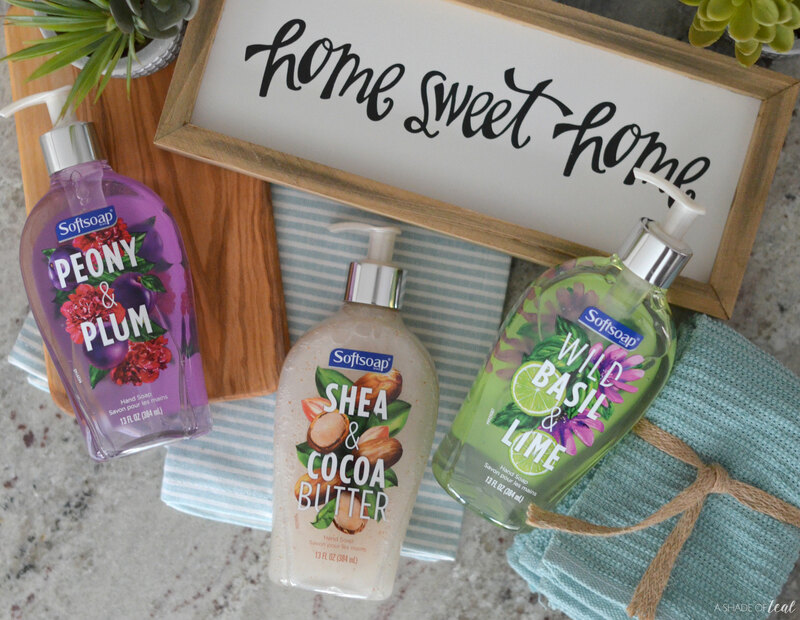 What’s your favorite gift to give for a housewarming gift? 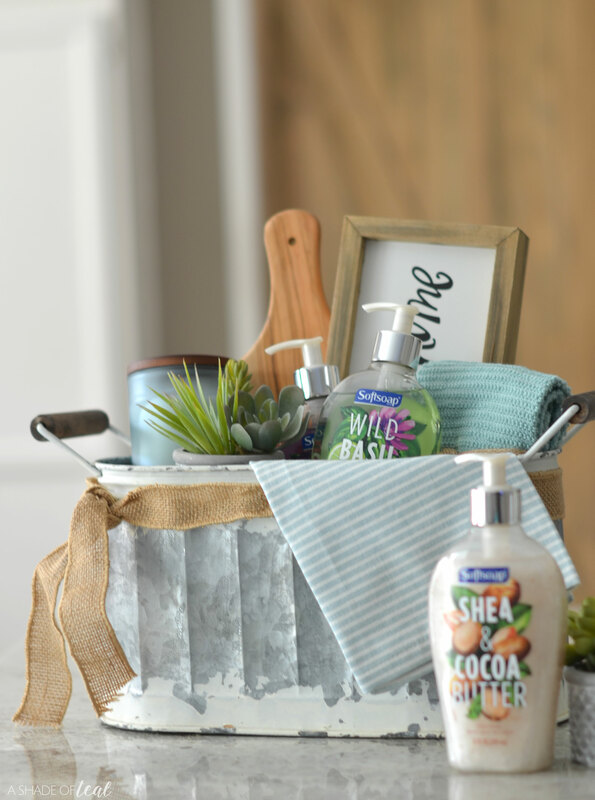 What else would you add to this Housewarming Gift Basket? 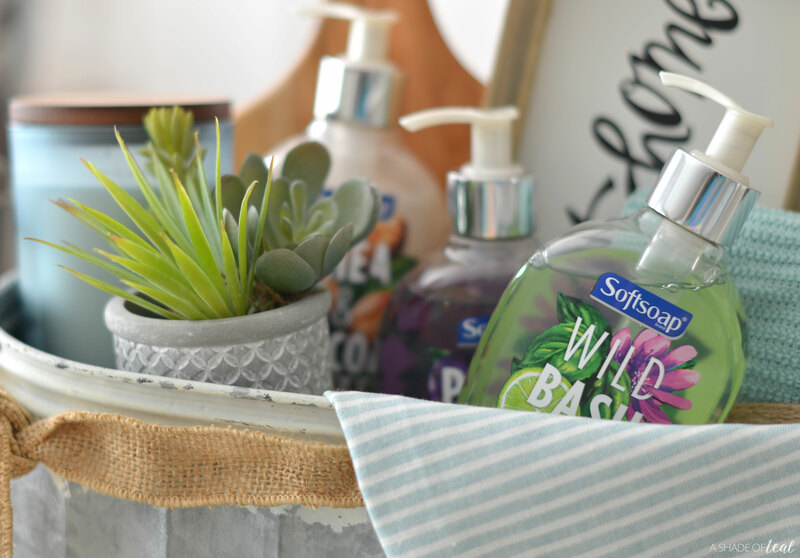 Make sure to go grab some Softsoap® Décor Collection® liquid hand soaps today! Exploring the 2018 HGTV® Dream Home!